The mystery surrounding a “lost” horse painting by Sir Alfred Munnings appears to have been solved – a fitting highlight from an important London exhibition of the renowned British artist’s work. There were hopes that publicity around the exhibition could end the mystery around the fate of one of his works. The show at the National Army Museum in London recreates the 1919 Royal Academy exhibition which featured 44 of Munnings’ paintings from his time as a war artist on the Western Front of World War 1 with the Canadian cavalry. Curator Emma Mawdsley said there are no records to show what became of the painting after the 1919 show. The work was therefore represented on the wall of the museum with an empty frame. The catalogue from the 1919 show described the work as a portrait of Brigadier-General Paterson’s Mare, Peggy. It was possible, she said, that the work went to Canada, given that the brigadier-general was from there. Her suspicions have proved correct. Gord Crossley, from the Fort Garry Horse Museum and Archives, posted on Horsetalk today that the work is in the collection of the Winnipeg Art Gallery. Crossley said that Brigadier General Paterson was from Winnipeg and presumably took the painting home with him. He said contact had been made with the National Army Museum and word was awaited. The oil-on-canvas painting is entitled simply Peggy, 1918, and measures 51cm by 61cm. Munnings’ impressionist paintings in the London exhibition cover equine subjects, portraiture and pastoral landscapes. They highlight the role of horses in military operations, capturing their beauty in the war-affected landscapes of France in 1918. Munnings was just finding fame as a portraitist and painter of British rural life when the First World War broke out in 1914. Blind in his right eye, he was denied a role in the Army on medical grounds. But, in 1918, he seized the opportunity to go to France as an official war artist working for the Canadian War Memorials Fund. Munnings provided an insight into the men of the Canadian Cavalry Brigade and the Canadian Forestry Corps. In early 1918, he was embedded with the Canadian Expeditionary Force, an army composed largely of citizen soldiers fighting on the Western Front. The Canadian War Memorials Fund was created by Lord Beaverbrook to document and memorialise the Canadian war effort at home and overseas through paintings and sculpture. His paintings demonstrate both the important role of the cavalry on the Western Front and the vital work behind the lines that sustained the war effort. 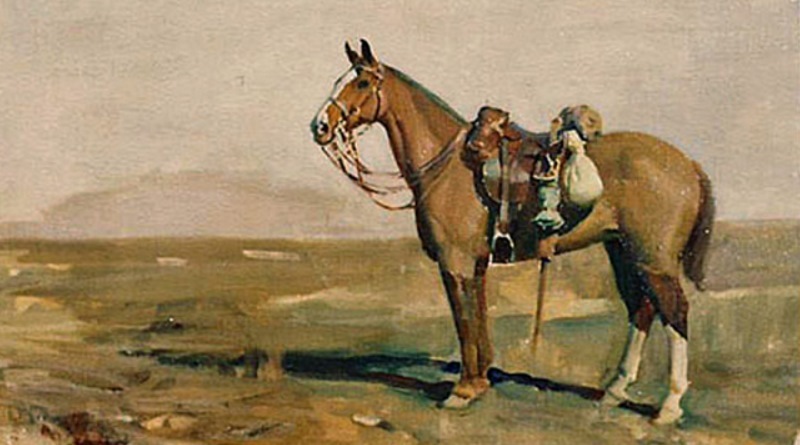 Munnings’ wartime artwork was pivotal in establishing his success and securing his admittance to the Royal Academy of Arts in 1919. The exhibition includes paintings on loan from the Canadian War Museum, as well as selected works from the National Army Museum’s own collection. It has been developed by the Canadian War Museum (Ottawa, Canada), in partnership with The Munnings Art Museum (Dedham, UK) and supported by The Beaverbrook Canadian Foundation. The exhibition opened last week and runs until March 3 next year.